Snoring is a sleep condition which affects more than 37 million American adults on a regular basis. While some people are only really light snorers, others can snore so loudly that it disrupts not only their sleep pattern but their partner’s as well. People who are most likely to become snorers are men who are overweight. While there are some women who are also snorers, it’s not quite as common. As a general rule of thumb, snoring usually worsens with age due to the relaxing of the throat muscles. And, it’s often associated with some daytime health dysfunction or heart disease. What’s Happening in the Body When You Snore? The reason people snore is that when the body is in rest mode (i.e. sleeping) the muscles of the throat relax. This causes the tongue to drop back and the throat to become more narrow. When breathing occurs the walls of the throat start to vibrate, causing a snoring sound. The narrower the airway gets, the louder the snoring becomes. In very severe cases, the throat becomes so narrow that it collapses completely, creating a condition that’s known as sleep apnea. While there is no permanent, one-stop solution for snoring, there are various things that can help, many of which don’t even cost money. The first thing to try is to change your sleeping position so that you sleep on your side. If you are overweight, shedding a few extra pounds could also help. Another thing to try that won’t cost you any money is to avoid alcohol. If you’ve tried all of these things and your snoring is still disturbing your sleep, then one good product to try that won’t cost a fortune is a chin strap. A chin strap works by keeping the mouth closed during sleep and by supporting the jaw in the meantime. High-quality fabric Most snoring chin straps these days are made using materials such as neoprene, polyester, or nylon. What makes these three materials so effective is that they’re lightweight and breathable. Comfort Considering you’re going to be wearing the chinstrap while you sleep, you’ll want to ensure you find one that’s comfortable. It should be long enough to keep the chin closed, but not so tight that you can’t open it if need be. Closure Many chin straps use hook-and-loop closures to keep it secure. These are quite good as they keep flush. You may find some models have buckles to do the same job. The problem with these is that they are quite chunky and can be more uncomfortable to lay on. Ease of Cleaning Thankfully, most snoring chin straps around these days are machine washable. However, if you do find yours is non machine-washable simple scrub it with a mild soap or shampoo to remove any dirt. Then, simply hang it to air dry. Regular cleaning will not only make the chin strap smell better, but it will also ensure good hygiene is maintained as well help preserve the lifespan of the product. Good fit While you want a chin strap to be fairly snug, you don’t want it to be so tight that it cuts off your circulation, obstructs your breathing in any way, or is just too uncomfortable. Avoid chin straps that offer a one-size-fits-all solution, as they rarely are. Also, if you don a beard, make sure you invest in one that’s long enough to keep your mouth closed while sleeping. Budget There really isn’t much to a chin strap, so don’t spend too much money on one, as they all do the same job. The only real differences you’ll find among them is that some will be made from better quality materials, and some will fit better than others. Other than that, they’re pretty much the same. Your hair length If you have long hair and need to wear a chin strap you may want to consider tying your hair up to sleep. This will help to avoid loose strands getting tangled and caught on the strap. 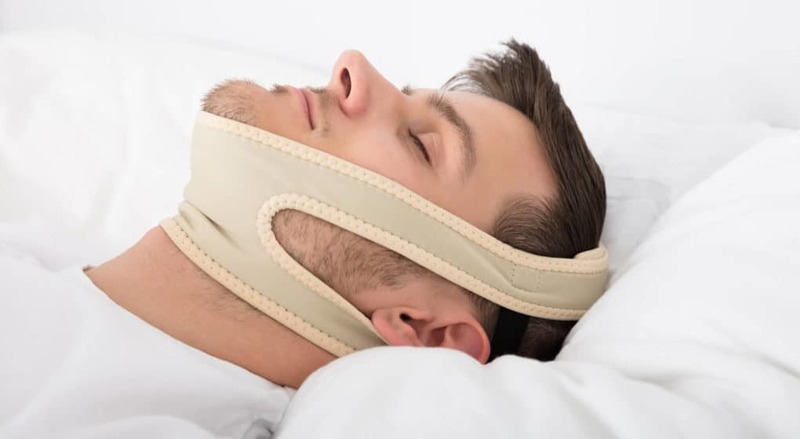 If you’re looking for a chin strap that’s both extremely comfortable and easy to use, then be sure to check out the Dermibest Anti Snoring Chin Strap Jaw Supporter. Made using all natural materials, this chin strap is not only great for the environment, but it’s good for you too. There’s no strong smell to it and it works perfectly fine in conjunction with a CPAP machine. One of the things I like most about this product is how well it fits. It may be one-size-fits-all, but it’s fully adjustable so that it fits pretty much everyone, including children. And, it even comes with a 100% money back guarantee if you’re not completely satisfied. The Dermibest Anti Snoring Chin Strap is made of a soft, breathable material that has a Velcro fastening, meaning it’s comfortable to wear and easy to use. It may be one of the more expensive models, but can you really put a price on a decent night’s sleep? 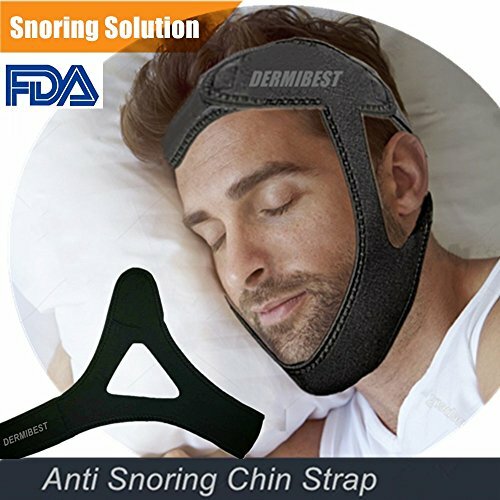 While on their own, snoring chin straps are pretty effective, if used alongside other aids, they’re even better, and that’s where this product comes in handy. 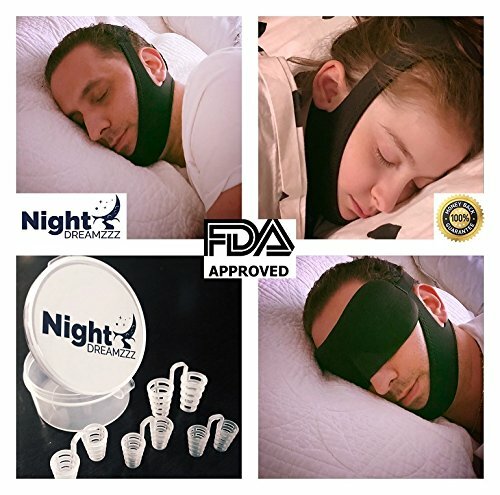 The Night Dreamzzz Premium Chin Strap package features not only a neoprene chin strap, but it also comes equipped with 4 different sized nasal dilators, and a soft silk eye mask complete with a travel bag to help you get a good night’s sleep. Being made of neoprene, the Night Dreamzzz chin strap is both super soft and itch-proof. It even has some antibacterial properties. The other great thing is that it’s extremely versatile and can be used the mask alongside a CPAP machine or without one. All-in-all, if you’re looking for a great anti snoring package that can help ease your snoring, this is definitely one of best to try. It fits flush against your head, there’s no irritation, and it doesn’t smell. My only slight criticism is that the straps did take a lot of tweaking before it fit properly. But once it was in place it worked wonders. If you’re looking for a snoring chin strap that’s made from some of the highest quality materials around, then you’re in the right place. 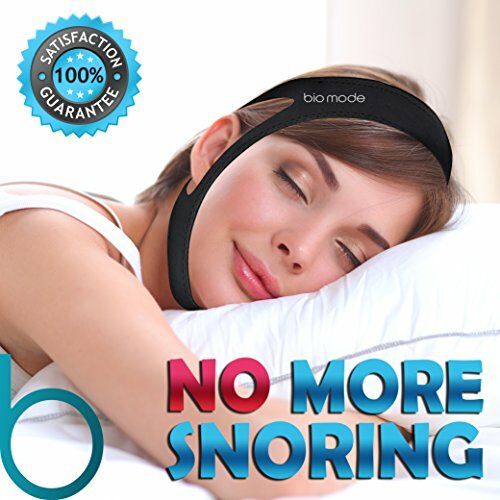 The Bio Mode Anti Snoring Chin Strap Device simply oozes quality. It consists of three main layers: the inner, the middle, and the outer. The inner layer is polyester, which makes the chin strap soft, comfortable, and flexible. While the middle layer is medical grade fiber cloth, adding breathability into the mix. 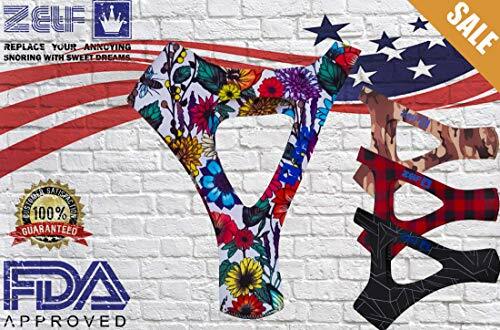 The outer layer is made from superior cloth and is smooth to touch. You can use this mask either on its own or alongside a CPAP machine. The only thing to be aware of with this chin strap is that it does smell quite a lot when you first take it out of its packaging. While this stench does start to fade after a while, it may be too off-putting for some. But overall, as mentioned above, it’s flexible, breathable, and should help you get a peaceful night’s sleep. 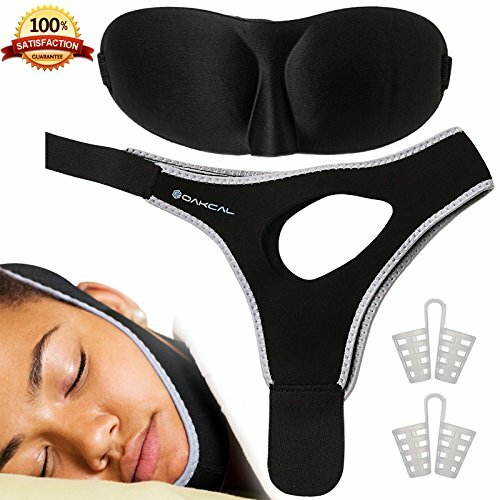 If you’ve never used an anti snoring chin strap before, and want to know how you’ll get along with one before investing too heavily into one, take a look at the Oakcal Anti Snoring Chin Strap Bundle. As well as supplying you with a highly functional and easily adaptable chin strap, you also get a silk mask and nose vents thrown into the mix. The chin strap itself is made of smooth neoprene with velcro fastenings, and is made to a very high standard. And, the best part is, that you get it all for less than the cost of a day’s worth of groceries. If you do have any issues, I would be surprised. But, in the rare event that does happen, the company are more than happy to give you a refund under their 100% satisfaction guarantee. Like some of the other products on here, it does smell a little upon opening. But if you wash it gently and leave it to air, you can soon rid the odor. Snoring is obviously no fun, but it can be! Why not try and brighten the situation by choosing one of these funky anti snoring chin straps on offer from Z&F. Available in 4 different designs, and made of 100% neoprene, I have to admit that these chin straps are my favorite of all the different models out at the moment. What I like most about these chin straps is the funky designs on offer. There’s a pretty flower option, an awesome army style option, a stylish black and red square option, and a cool black and sharp white lines option. Another great selling point for this product is that it’s been approved by the FDA, so you can be sure you’re getting high-quality goods. They fit well, are easily adjustable, and, the price isn’t too bad either. My only slight criticism is that the strap closer tends to attract and trap long hair, so you may want to consider sleeping with your hair tied. 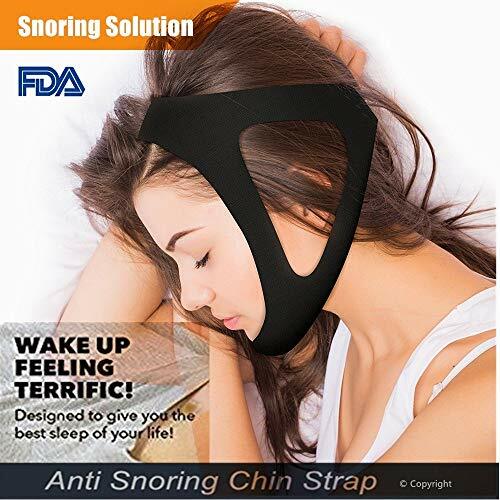 Overall, they may not come with all the extras that the bundles give you, but you’re certainly getting great value for money with these anti snoring chin straps. I hope you found the above information useful and are not just about ready to make your snoring chin strap purchase. Just remember, it’s not about what it looks like, but more about how it feels. And even more importantly, how it can relieve your snoring. So, take action today and suffer no more. Invest in a good snoring chin strap and hopefully, you’ll soon be getting that good night’s sleep that you deserve. Q: How serious is snoring? A: It depends. Snoring varies in severity across different people. So, if someone is a light snorer, they might not be affected by it too much. If however, they’re a heavy snorer, not only will it start to disturb their own night’s sleep, but it may also affect anyone else sleeping nearby. Non-snorers will have much more energy than snorers as they will have had a decent night’s sleep. Q: Can chin straps be used with crowns or dentures? A: Absolutely. Because there is nothing invasive or intrusive with a chin strap, these products aren’t usually an issue for those who have had dental work done. Q: Are there any type of snorers that the chin straps won’t work for? Sleep apnea A chin strap is not very suitable if you suffer from sleep apnea. This is because closing the mouth completely will worsen the symptoms. Tossing while you sleep If you’re someone who tosses and turns a lot while they sleep the chin strap could become dislodged and would, therefore, be of no benefit. That being said, if you opt for a model with longer straps, you may be able to secure it tighter and would be less likely to fall off. Nasal congestion If your snoring is caused by nasal congestion, chin straps probably aren’t the best option for you. In fact, it may make sleeping more problematic as you’ll be unable to breathe as freely through your mouth.